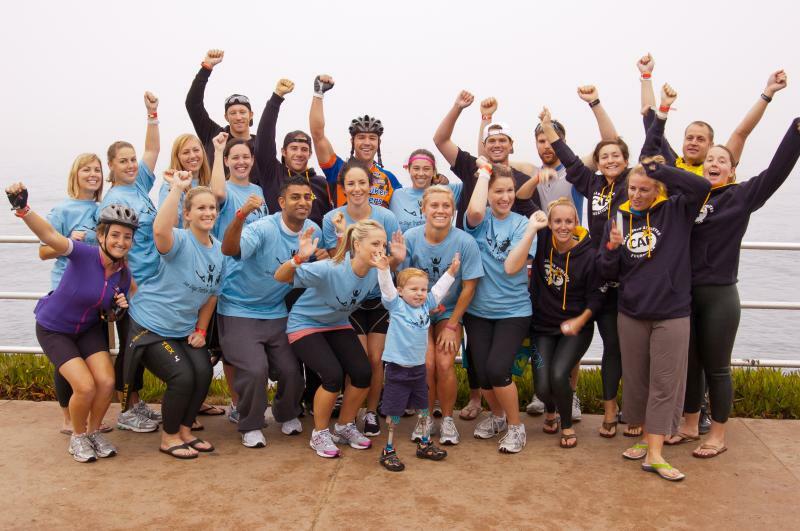 Founded in June of 2011, Team JJ currently consists of Joshua Miller (JJ), his parents, 12 teams of 36 athletes and 7 individuals doing the entire triathlon on October 20, 2013. 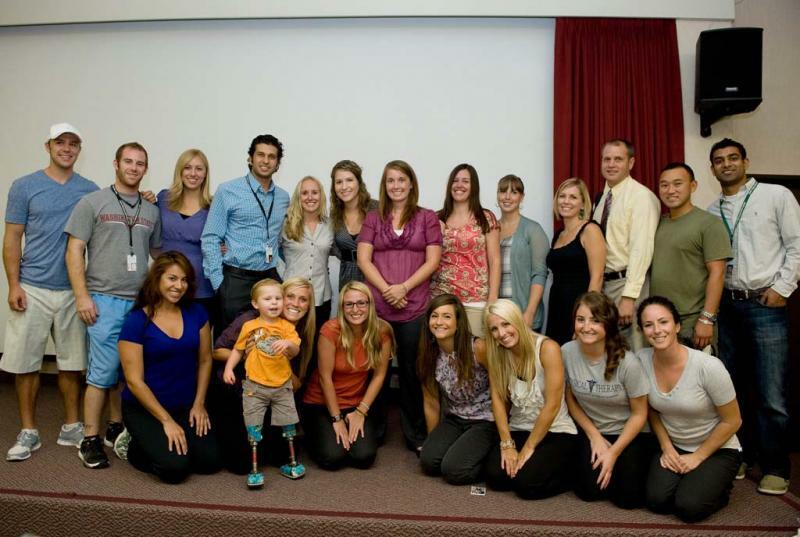 In 2009 we started learning about Challenged Athletes Foundation through some of the people that were helping us at Loma Linda University Medical Center Orthotic and Prosthetic. We were unable to attend that year's San Diego Triathlon Challenge due to Joshua's medical needs at the time but made the decision to attend the following year. We then were introduced to Rudy Garcia-Tolson a two time gold para-olympian athlete that had been the face of CAF. He had competed extensively in the events CAF held year round and became a spokesperson for them. He later would go on to compete and finish an Ironman Triathlon. We were encouraged by Rudy's story and realized that Joshua would have so many more opportunities than his father, also a double amputee, had as a child. There seems to be no reason that Joshua will not be able to ride a regular bike some day and run with bending prosthetics. We had a great experience attending the 2010 San Diego Triathlon Challenge in La Jolla, CA. The weekend started out with a running clinic held by Ossur. This was a fabulous event. We were able to meet with other children with amputations and their families. Ossur and volunteers worked with individuals to help them with their gait, manuever, and run. Joshua participated in an obstacle course with a team of about 20 other amputees against another 20 or so amputees of all ages. I was silly thinking that the team wouldn't want him because of course a newly two year old child would slow them down and prevent them from winning. I was so wrong and didn't understand the objective. It was all for motivation, encouragement, and fun. And boy was it! Joshua took off and completed the course with a little help flying over a 3 foot jump. He loved it and everyone cheered for him. It was the biggest boost we had experienced. The following day was incredible. We started at the crack of dawn with the Star Spangled Banner being sung by a challenged athlete that came all the way from Africa. The challenged athletes for each event were then presented, the Operation Rebound athletes were presented, and then the handicapped children were presented in front of the crowd with our little Joshua enjoying it all. We watched the start of the race with 5 heats of swimmers taking off. That was followed by the Kids' Fun Run which had two age groups. We threw Joshua in the race at the last minute assuming initially that he was too young to compete. Again we kept missing the point that CAF wants to make things possible for individuals with handicaps and do away with limitations. We spent the day enjoying the race, booths, food, music, kids' games, people, and beautiful La Jolla Cove. That weekend we had our first introduction to Jonah, Cameron, Cody, and Ezra, four great kids with wonderful personalities. 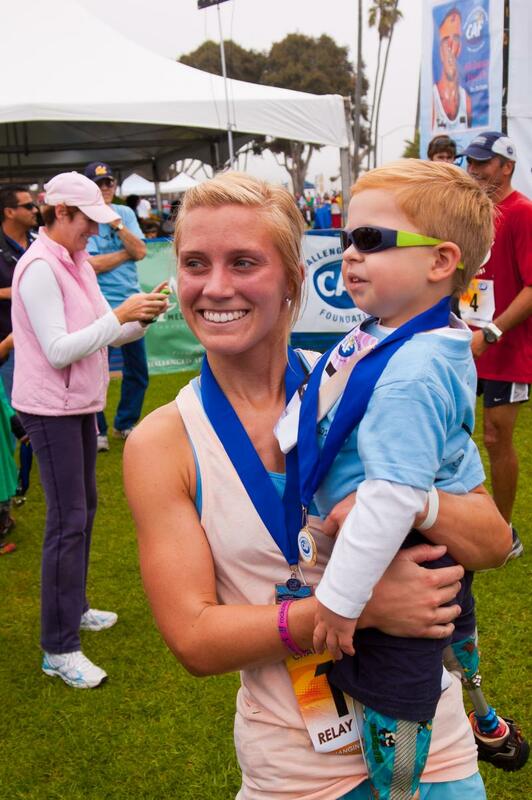 Cody and Ezra's families already had teams competing in the race in their sons' names with Team Cody and Team Ezra. Cody himself, probably eight years old was swimming the 1.2 mile rough water swim for his team. Let me remind you that Cody is also a double above the knee amputee! I think that it was that day that confirmed the idea that we, as Joshua's parents, wanted to fundraise for CAF and help in this great cause that would provide multiple opportunities for those with some type of disability to get involved actively and make grants available for this population to get adapted equipment and training to lead a more active lifestyle. I suppose that in the United States we are only really limited by our own minds. We thought that we might start Team JJ in the distant future maybe when Joshua turned 6 or 7 and then only if he was interested in competing. We did not think that we could make a difference so soon. We started sharing our ideas and collecting information to get prepared. We were then offered an opportunity to attend Camp No Limits when a spot became available after another family turned down the opportunity to attend. The Amputee Connection of Redlands sponsored families of a new group that was started to connect families with children that had experienced limb loss with other such families in southern California. We were on our way to camp in Big Bear! A group of girls all wearing their university's t-shirts had been around the camp for the afternoon helping with the other campers and visiting families. For whatever reason we had not connected but then they approached and asked if they could take a picture wih Joshua. For the first time Joshua acted shy as this large number of beautiful girls gathered around him to take a pictue with him. In a conversation with Natalie and a couple of the other girls something I said peaked an interest in Natalie about the triathlon and our desire to start Team JJ. I introduced Natalie to a team leader of another team so that he could share more information with her about it and to see if she was really interested in competing on Team JJ. I did not know that he with a team of about 60 would solicit Natalie and the other students to join his well established team. People are motivated to raise money for such a great organization. It was a close call but luckily Natalie was interested in joining Team JJ and seeing if fellow students would like the opportunity to compete in a triathlon representing Joshua. We unofficially started Team JJ on Saturday, June 18, 2011. For those that doubt the Hand of God working I just have to say that I have to give all the glory to God. In considering this idea since 2009, we wanted to know how we could use it to glorify God and help others. We hoped that Joshua could inspire others, we could thank and promote those who have helped us, that we could promote pro-life issues and the value each individual has regardless of disabilities and or mental capacity, and that we could use such opportunities to share the good news of the Gospel of Jesus Christ. Natalie and I had to wait until after previously scheduled summer vacations and plans were done to really confirm and discuss what we wanted to do. Natalie has since organized 9 athletic teams that will be competing this year, which is incredible considering how short of a time we have had to plan and how short of a time athletes will have to prepare. She was able to do this in spite of her school being on summer break. These participants are mainly comprised of students that attend Western University which is in our neighboring city. Recently, Natalie shared with me that she was drawn to Joshua and purposely sought us out at the camp. We had discovered that we live within 2 miles of each other and upon further discussion this August realized that we both graduated from the same university, Azusa Pacific University, which I hope to promote, and we both attend the same church, Christ's Church of the Valley in San Dimas! What are the chances? God is awesome! A special thanks to Clayton Frech of Team Ezra that let me interview him and rack his brain for information that would help us get Team JJ started. He also made himself available if I had any further questions. His son Ezra Frech was Challenged Athletes Foundations' Rising Star for 2010. JJ's first kids' fun run at the 2010 SDTC "A star is born!" "Photo courtesy by Jeff Malet, Western University of Health Sciences."